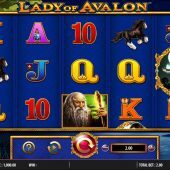 Lady of Avalon slot by Barcrest is pretty simple in every way, a fact which you'll soon cotton on to when you read further and realise you know the mechanic very well! The reels are plain blue and lie over an island inlet in the dark starry sky although in general it's a very plain appearance we get here. We play to some gentle fantasy music appropriate to this old classic legend which I must say has been aesthetically bettered by virtually all its predecessors such as Microgaming's Avalon, Avalon II and by their original King Arthur slot. Will we leave this mysterious kingdom richer, or will out bankroll be forever locked in the stone? 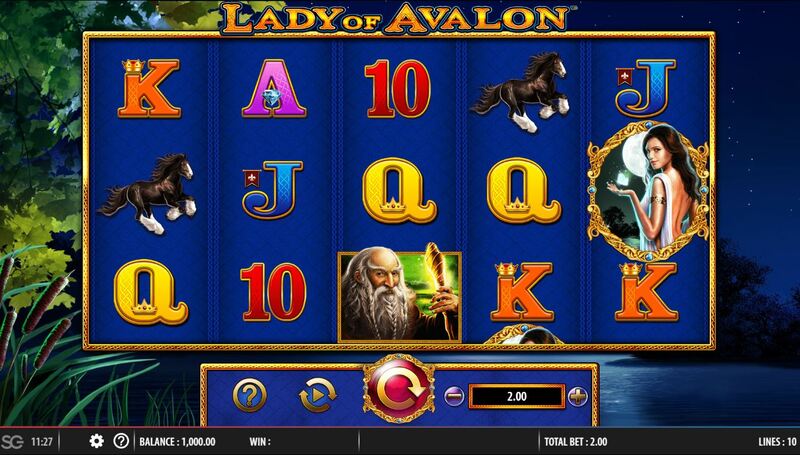 There are 10 fixed pay lines over 5 reels of 3 rows each on Lady of Avalon slot. Symbols are all single and a clue to the high volatility will be in the high 5-of-a-kind pays. The best is the Wise Man at 500x bet, Castle 200x, Book or Horse 75x bet with 5 card values of which the A or K pays 15x and the other three 10x for a full line. If those pays haven't already told you what model you are seeing here, then this fact likely will - the Lady of Avalon scatter appears on all the reels and doubles up as the Wild symbol. So landing 3 or more Lady of Avalon scatters triggers 10 free games, but even if they don't add any further free games 5 of them would be nice as you get a 200x bet win for them. You will then be taken to an animated screen which will randomly select any icon bar the Wild as an expanding scatter for the free spins, which can be retriggered. This means that if you get 2 (only for the picture symbols) or 3-plus of that symbol it will expand across all 10 lines and pay scattered, effectively a 10x multiplier for all expanded wins.